Billboards are so ubiquitous in the modern world, many people barely even notice them anymore. So, some advertisers have gotten ultra-creative with their outdoor advertising, relying on eye-catching imagery and unusual proportions to grab the attention of the public. From shocking props like sliced pigeons to a billboard you can eat, these 15 clever advertising campaigns expand outside the box to interact with the world outside. 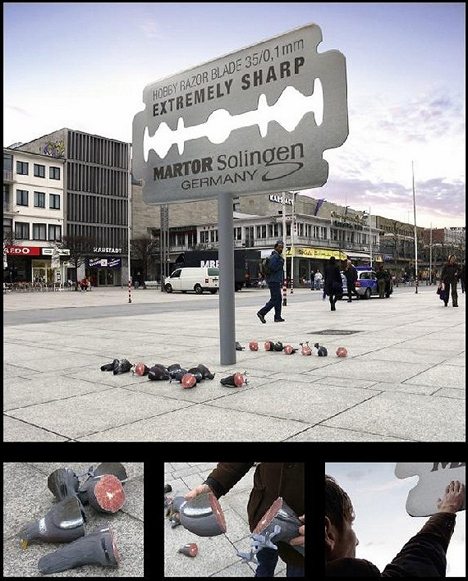 German razor company Martor Solingen “demonstrated” the sharpness of their product with this clever billboard, strewing the ground around it with sliced-up rubber pigeons. 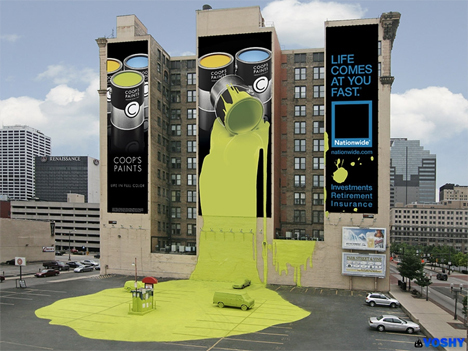 Nationwide insurance turned a fictional paint company’s billboard into a colorful, messy disaster in this unique ad, spilling a massive puddle of yellow paint down the side of a building and into a parking lot, even covering several vehicles. 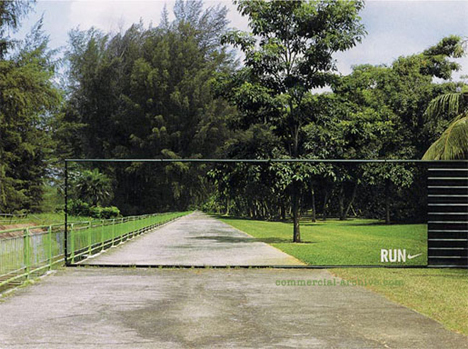 Adidas was clearly very excited for the 2006 World Cup when they unveiled a series of billboard ads so attention-grabbing, they risked causing accidents. 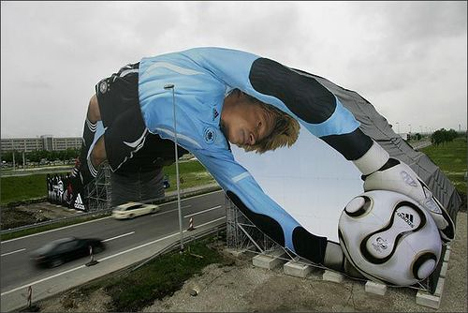 This particular billboard depicts a soccer player – or football player, if you’re outside the U.S. – stretching over a road like a mythological giant. It must be tough to come up with a creative ad campaign for disposable razors – after all, how many times can you show a man’s smooth hairless face and still get people to notice? 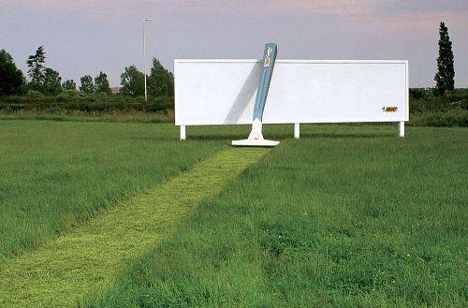 This billboard takes a different tack, with a giant razor seemingly giving a stretch of grass a nice close shave. What time is it? 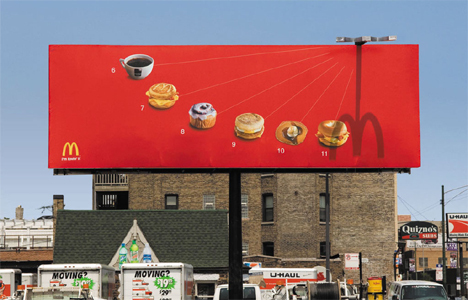 Pancake-o’-clock, if you go by this incredibly creative billboard ‘sundial’, installed by fast food giant McDonalds in Chicago in 2006. The Leo Burnett ad agency commissioned for the project worked with an engineer to choose the best possible location to achieve the best effect, with an aluminum replica of the iconic golden arches casting its shadow over a certain menu item each hour. 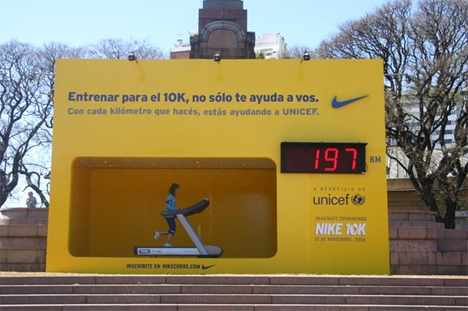 Nike encouraged passersby to stop and walk or run a while on an interactive, ground level billboard with a built-in treadmill, located in Mexico. For every kilometer run, Nike donated a certain amount of money to Unicef. Penline must have felt pretty confident in their product to actually demonstrate it in a billboard. 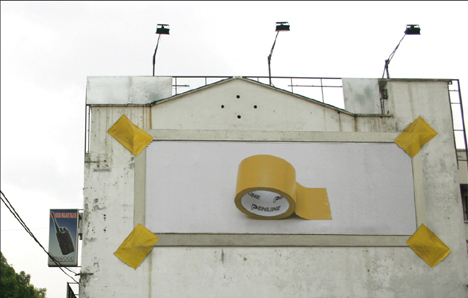 If the tape had failed, the ad would have been disastrous, but it worked well enough to win the ad a Cannes Lions 2007 Silver award. 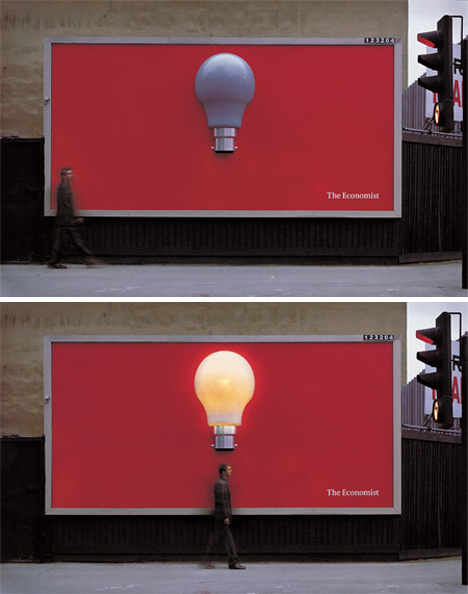 Talk about a bright idea: this billboard by the Economist uses a motion sensor to detect people walking beneath it, and the light bulb illuminates at just the right moment. 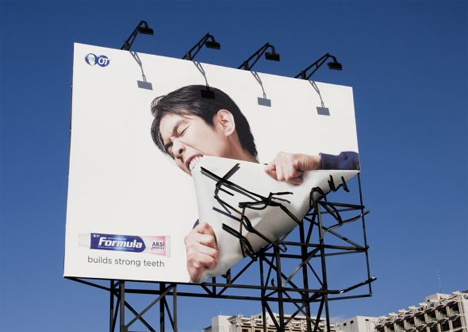 Passersby aren’t likely to miss this unusual ad for Formula Toothcare. It would certainly take some extremely strong teeth to pull off this feat. 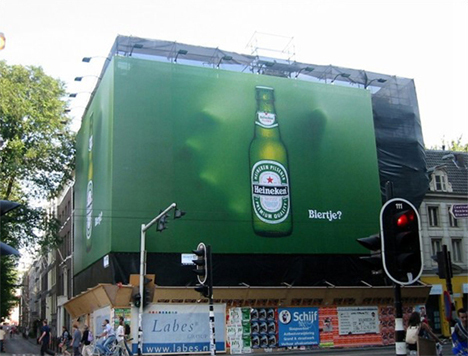 What would be an extremely simple and perhaps boring billboard otherwise is transformed into something memorable by the addition of a three-dimensional hand reaching from behind in an attempt to grab the bottle of Heineken. Is it a frame that you can walk through? A painting? A transparent billboard? It’s difficult to say from the images, therefore it’s difficult to interpret what Nike was going for with this strange series of ads. Hopefully it’s the former, because the other possibilities make it seem as if the company wants their customers to slam into a wall. 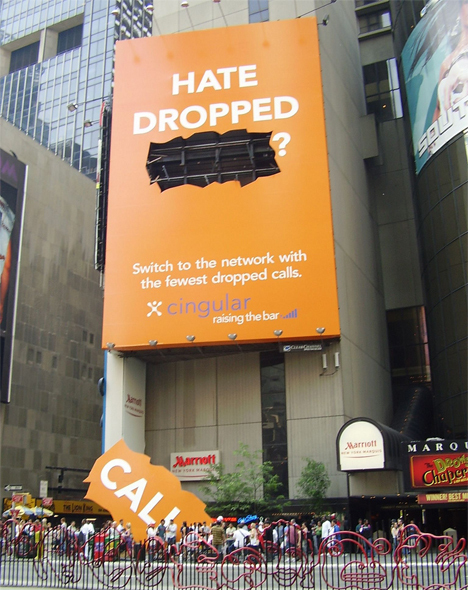 Cingular turned consumers’ biggest complaint about cellular phone service into a gigantic Times Square advertisement featuring a cutout of the word ‘calls’ on the ground below the billboard. The world’s first edible chocolate billboard didn’t last long. 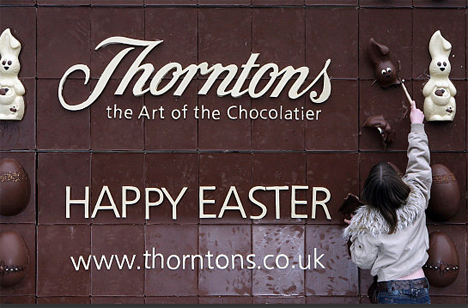 Thorntons, a British chocolate company, unveiled an 860-lb, 14.5ft – 9ft billboard made with 10 chocolate bunnies, 72 giant chocolate eggs and 128 chocolate panels in London in 2007. The billboard was consumed by shoppers within three hours of going up. 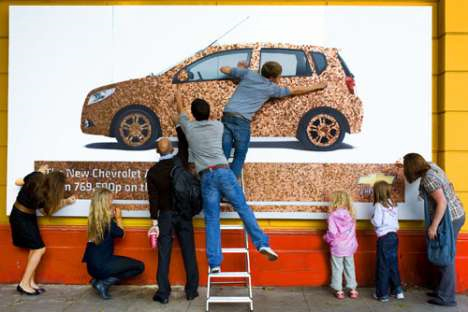 Another consumable billboard that was destroyed by onlookers rather quickly is this penny creation, advertising the Chevrolet Aveo. The billboard featured a car made entirely from 20,000 one-pence coins which were picked off by passersby within 30 minutes. 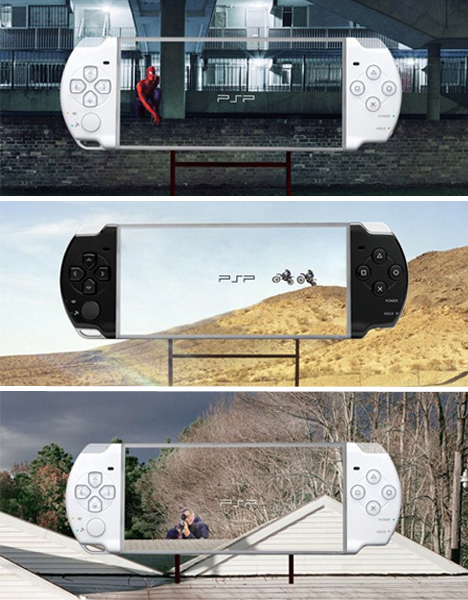 Adventure is anywhere, these billboards seem to say – any ordinary place could be the setting for a range of exciting activities when you’ve got a Sony PSP. 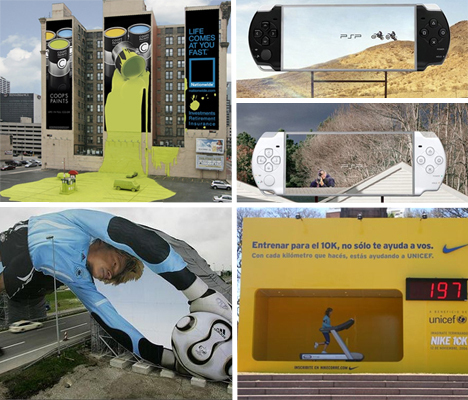 Unfortunately, these were not real Sony billboards but a clever concept created by an advertising student.